This collection was spun out of dreams. 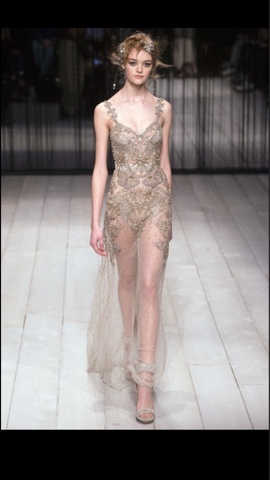 Sarah Burton is gifted. She described her woman as: “Almost sleepwalking, in a state where reality and dreams become blurred.” Toward the end, this imagined character had become an almost incorporeal sylph, like a vision from an Erté drawing, trailing a silver-sprinkled cloak embroidered with stardust and the phases of the moon. But the collection had substance too. It started with black coats, variously jacquarded with pocket watches, eyes, and butterflies, or sculpted from fine leather and then hand-painted with flowers by a specialist floral artist. Tailoring was always one of McQueen’s power bases, and the mannish Savile Row exactitude of the double-lapel suits honored that fully but in a modern, feminine, unconstricting way. The tenderness and the technical expertise Sarah mustered for this collection was a triumph, taking hundreds of hours of skilled labor by dozens of specialists in London and Italy. Burton can now go off and sleep easy in the knowledge that her own vision for McQueen is fully realized and applauded to the skies. The more she has relaxed into the confidence of her feminine instincts, the better she’s become. It was fitting that the venue she chose was the same one in which she assisted Lee McQueen at a show 20 years ago. In a way, it was a homecoming—and, really, why shouldn’t it stay that way? This is the place Alexander McQueen belongs. It is the dream for London if this show continued to cast its spell in the city of its origin.